Swansea, UK - February 9, 2008 - Reinvented Software announced Feeder 1.5 today. Feeder is a versatile RSS editor for creating news feeds, podcasts and appcasts. Version 1.5 includes an updated user interface for Mac OS X Leopard and now supports thumbnails for video podcasts with the Media RSS extension, adds password-less SFTP, and brings improvements for tagging MP4 video files, item editing and Sparkle appcasts. Feeder makes working with RSS as straightforward as writing email and is packed with thoughtful features such as templates, previews, HTML editing and auto-completion. For podcasters, Feeder includes full support for the iTunes RSS podcasting extensions, drag and drop episode creation, an iTunes Store preview and the ability to tag all popular podcast media files. Feeder can publish feeds and associated files via FTP, SFTP, .Mac and file export. In Feeder 1.5, video podcasting is improved with support for thumbnails using the Media RSS extension, used for previewing videos by search engines and applications such as Miro. This version also improves performance when tagging MP4 format files, including those used for iPod, iPhone and Apple TV and has the ability to redirect uploaded enclosure files through sites such as blubrry.com for tracking podcast statistics. Additionally, Feeder 1.5 can now publish using password-less SFTP and includes editing improvements for pasting links and working with templates. For Sparkle appcasts, Feeder can now automatically generate MD5 sums and DSA signatures for software updates. 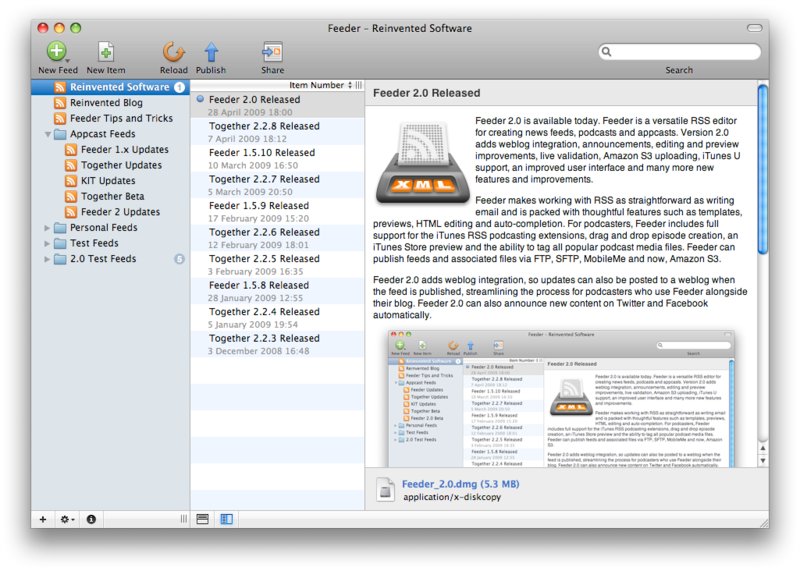 Finally, Feeder's user interface has been updated for Mac OS X Leopard with new toolbar icons and sidebar. Feeder requires Mac OS X 10.4 Tiger or later, and is available from the Reinvented Software web site as a 15-day trial that can be unlocked upon purchase. Reinvented Software was founded in August 2004 by long-time Mac developer Steve Harris who, having wasted 10 years working for other people, decided to dedicate his life to making the best software in the world - software for the Mac. Reinvented Software currently publishes two applications: Together, a revolutionary file organizer and Feeder, the premier RSS and podcast publishing application, both exclusively for Mac OS X.